DBE Global Freight Forwarding and Logistics offers exclusive interior packaging for each container we build. Our committed crating teams take various factors into consideration including dimensions, weight, fragility, mode of transport and final destination requirements. Crates and containers are lined and filled with the appropriate amount of cushioning agents to coincide with the shipments requirements to ensure items are secure for transport. DBE Global Freight Forwarding and Logistics utilizes a variety of cushioning agents to prep our containers for shipping including, polyurethane, polyether and polystyrene foams. We also strive to use the latest technology in eco-friendly cushioning products including recycled cardboard materials. Our services also include a consultative approach on your product’s packaging requirements. Our packing experts will work with you and your product’s specifications to provide the most suitable solutions for packaging options to ensure safe transport and delivery. Contact your nearest DBE Global Freight Forwarding and Logistics location to speak with a representative about our custom packing options in order to reduce your company’s shipping costs, damages and lost revenues. 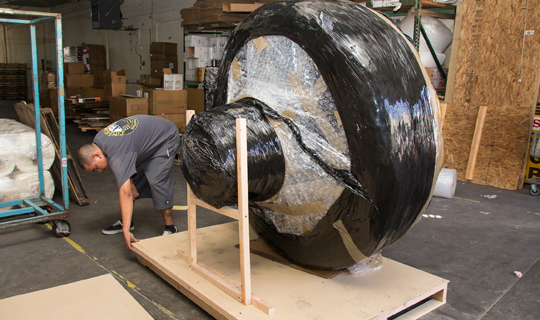 We specialize in fragile, heavy, awkward, oversized & time-sensitive shipments. In addition to our services, we also offer pickup & delivery to business & residential addresses.